We head out onto the snow-covered frozen lake with darkening skies on the horizon. 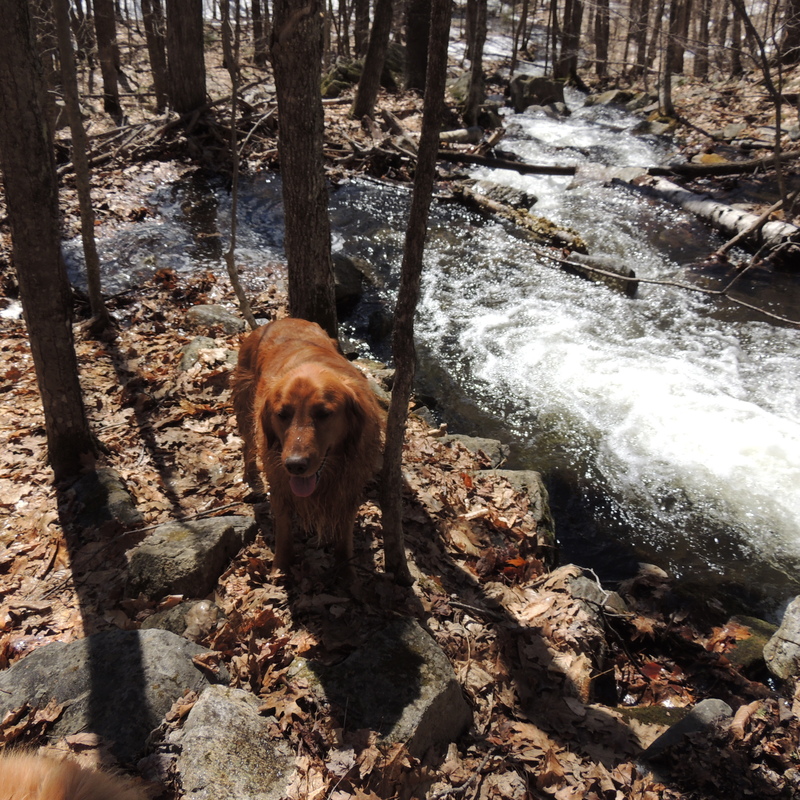 The golden retrievers excited at getting out for the daily nature excursion. Northwest winds, cold and cloud do not dampen our enthusiasm as a change of weather, a collision of fronts low and high fascinate on a piece of the earth that we inhabit together and alone in our exploration. Just as we reached the far shore the dark clouds opened, shearing winds broke free. 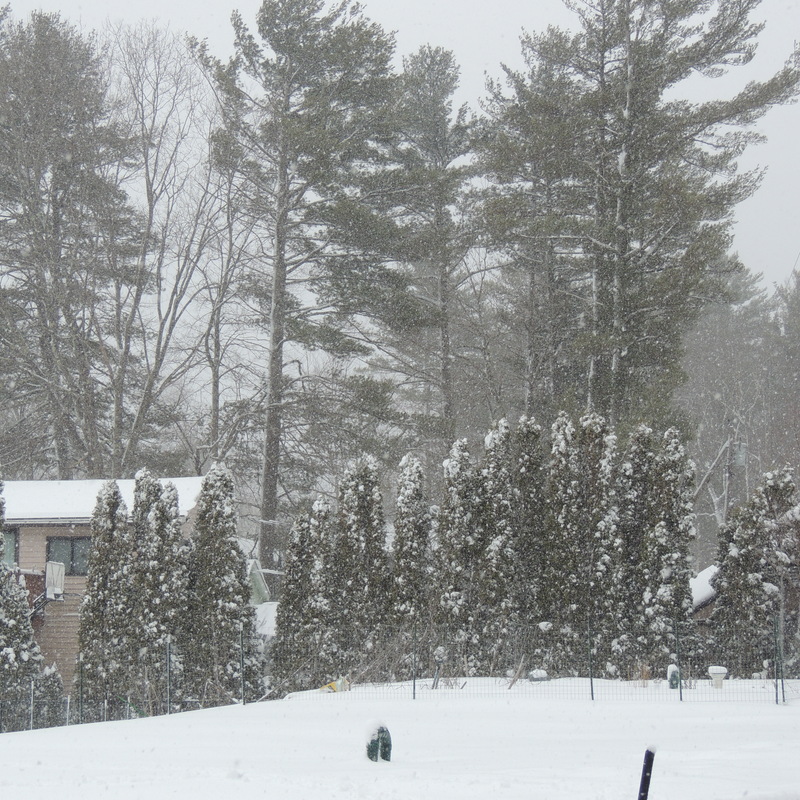 First snow then snow squalls in wind-blown gust engulfed us in a dancing natural whiteout of changing weather and temperature. Turn to get the wind with us as we head back toward the warm shelter of home. Stopped in awe at the beautiful and wild chaos moving all around Snow devils jumped up everywhere and moved to gusty rhythms in wild dances Spins swirls to and fro in small tornadoes of snow. They existed as energetic torrents of wispy shades of white as alive as you and I. They lived a short time jumping up dancing and moving only to disappear in the distance. Others seemed to see the fun and jump up to take their turn as dancing ghosts. Past snow lifts from the lake to grab a new snowy partner in a celebration of the cold and gusty winds that supply the music. They move and fly across the floor as we make steps toward home. First steps in new snow Ghosts and Apparitions up from the Past appear to move to the Future as we walked among them in the Present. Just another gift from the great spirit in the sky comes down to play on a mild calm to windy cold day. We bend at the waist bow down and thank you for the dance. Yet another rain is coming tonight so I strapped (the old term), stepped into cross country skis as our golden ‘Mari’ picked out the ball of the day and we set out down lake. Conditions were good, slick not wet. 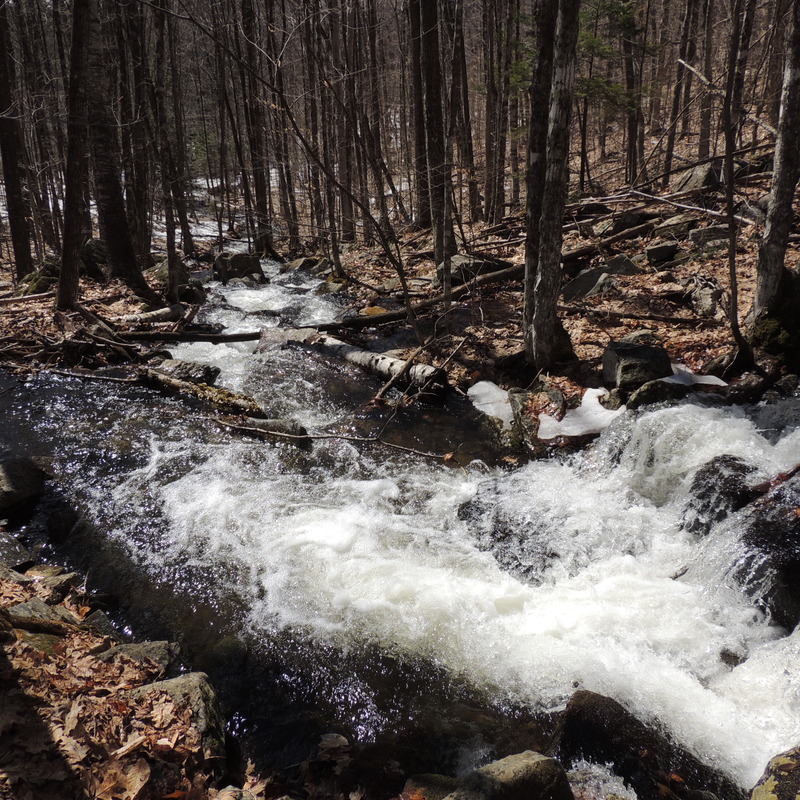 We followed the first outlet which fills a small pond to and across a dirt road and into the woods on an old logging path. The path soon disappeared into new growth with an uneven obstacle filled journey ahead. The golden can go under and around small bush tree fallen log bramble and briar where the rabbits can go. There is a feeling of freedom in leaving known path. I shift in zigzag moves looking for the (easiest), less difficult way forward. A sense of direction and fondness for a feeling of motion in emotion my guide. 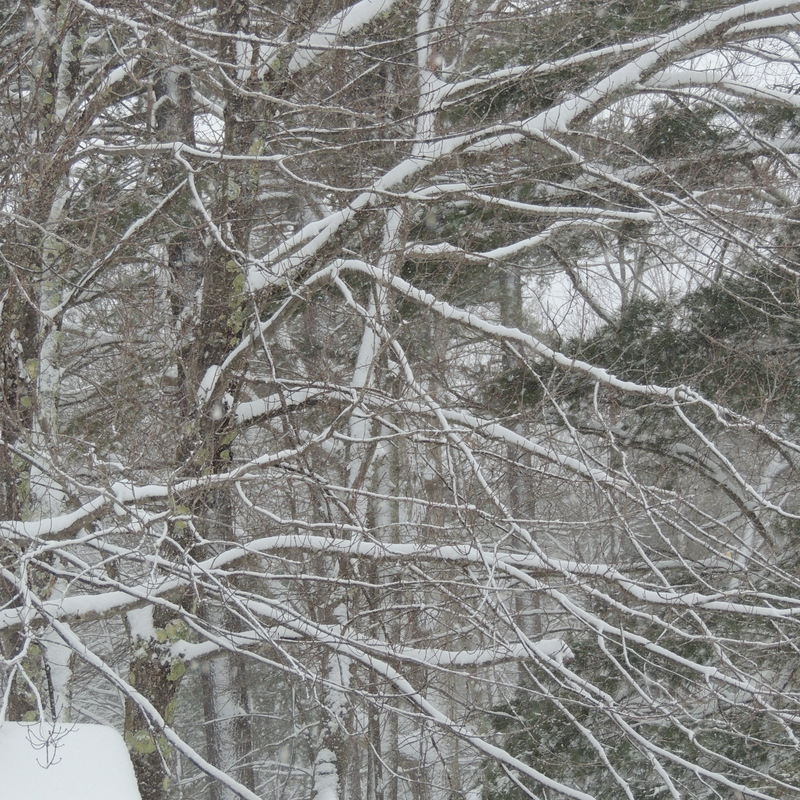 The woods are silent but for our breathing, snap of breaking branch, crunch swish of skis traversing snow. Perfect circles of brown under the evergreen trees, a dry place to stop, gather thought and bearing, to feel the freedom in this live free or die state I am in. Fully alive, partially lost, physically strong and breaking trail in woods and wetlands seldom tread by man. A half hour in I find remnants of what was once a field property border, an old stone wall. Built boulder by rock by stone in clearing a field which is now reclaimed by the forest wood growth it was before man attempted to tame it. The nature of this place laughs this day on my clumsy country crossing. Direction change from South to South West as the wall which appears to have cornered the field disappears with my tracks. Sense of direction and feeling for light penetrating clouds now carry me toward a grand wetland depression in forested hills. 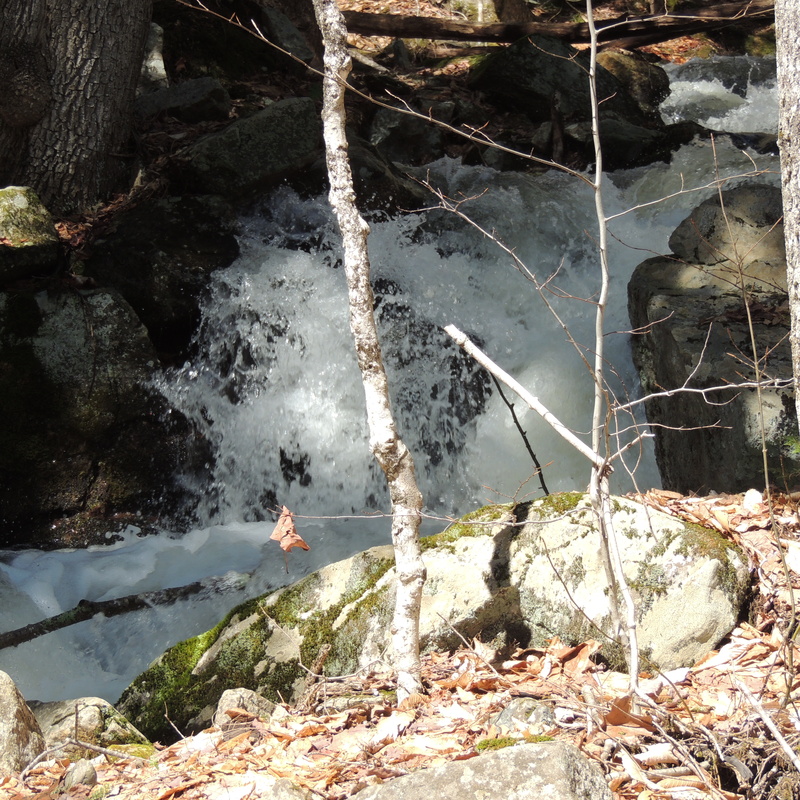 I know it as a continuation of the water flow from lake to pond to steam to trickles that drain to wetlands. Until today it was only a view from an old fire lane that traverses conservation land. Find the filtered sunlight and search the distance for the open space beyond the wood. It is there wetland lives and when I find it I will follow North East from trail breaking toward broken trail I know. A flash of white on a hill ahead and above me is followed by another as I focus. I halt and signal the golden to stay quiet for it is a family of deer on one of their familiar trails. We had seen tracks, rabbit deer perhaps moose but there is magic in the meeting! Our silence allowed them to move calm and free, our scent lost in light breeze. We climb the hill and follow tracks to the SW end of the wetland. A break in the trees frames the view. Home to the deer, to me it is a dear moment in viewing. 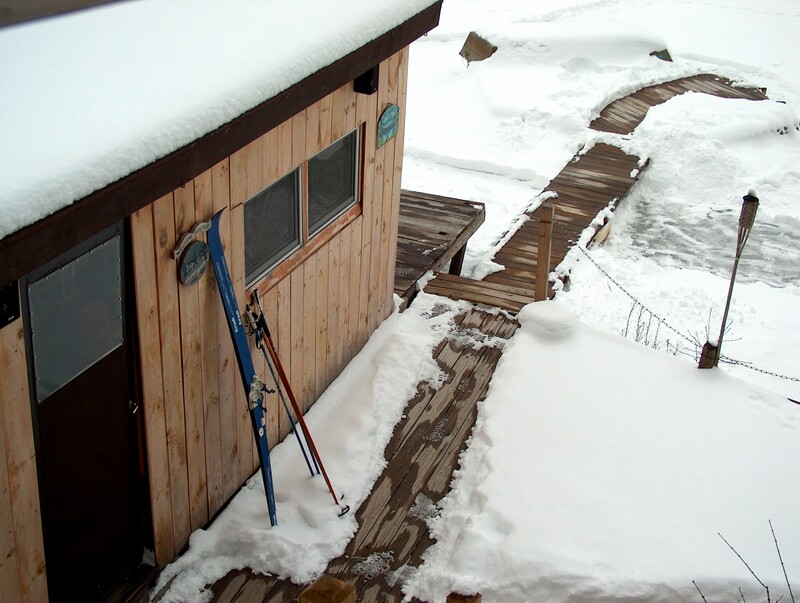 With no easy way down I remove the skis and use the pole straps to bundle them. 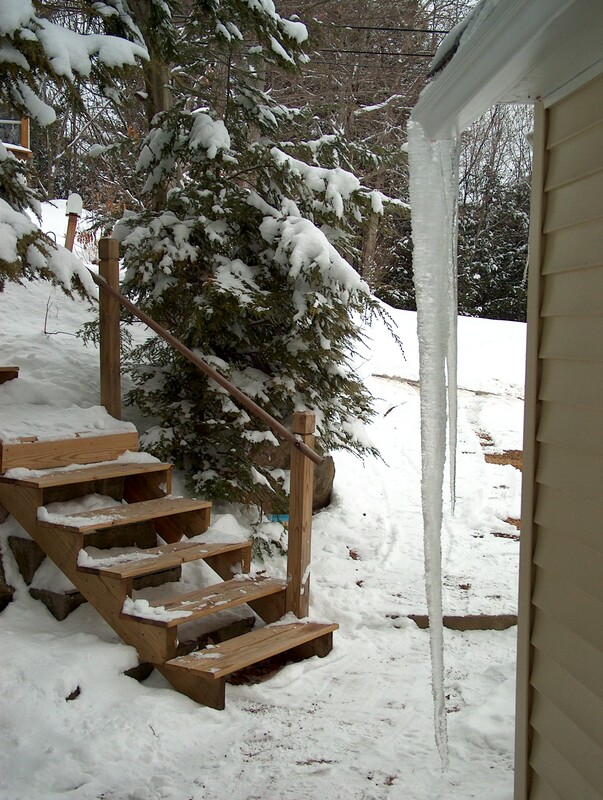 Now hiking in 4 to 12″ of snow I can follow a more direct route. 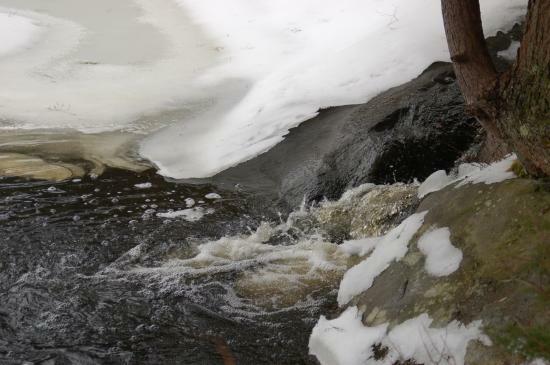 We move up and down hill to gully to hill, jumping across streamlets and slow and careful on the weak ice of pieces of wetland. Joys in the movement, the sights, the feel, the physical cost paid back ten times in sore satisfaction. My mind map of the woods and wetland expanded. The view from the road is now a topographical memory of depth sound sight and feeling and on this day it feels like home. 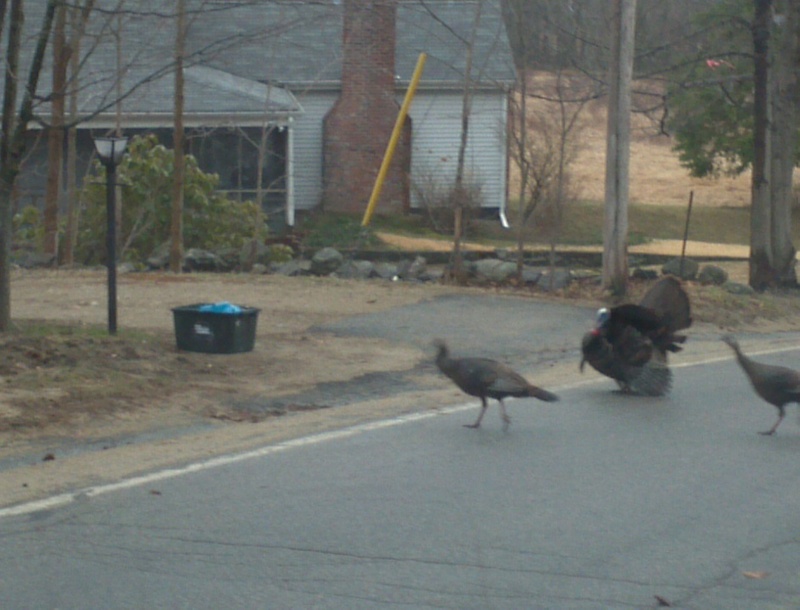 How do the Turkeys cross the Road!?!? 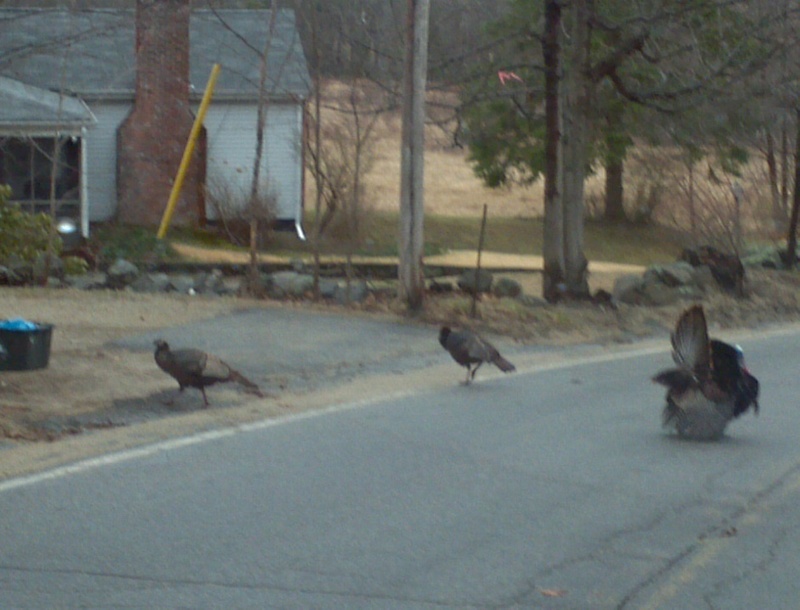 Up until the beginning of winter I lived in Raymond, N.H. and saw turkeys everyday. On day early in the morning the Tom jumped out into the road and I stopped. To my amazement he proceeded to fluff up all of his feathers and produced an imposing figure to see. He then told his brood of hens to cross the road. He yelled at the last couple to hurry, closed up his feathers and followed his entourage into the woods. Weeks later the following article appeared on the first page of the UNION LEADER newspaper. I had not seen TOM in awhile and was saddened by the thoughtlessness of those involved. We must respect other living things and allow them to live in peace! 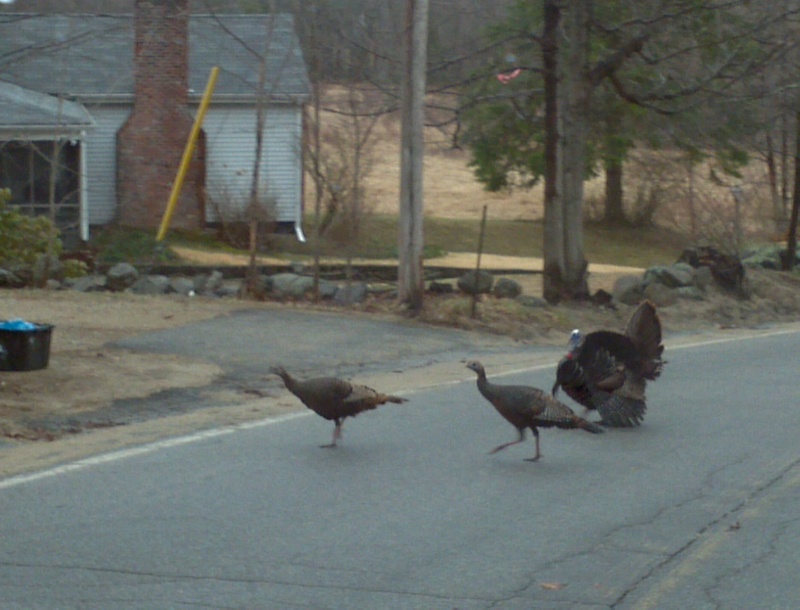 RAYMOND — Two recent cases of wild turkeys intentionally being run over by vehicles have ruffled some feathers. “Unfortunately, it’s more common than we’d like to see,” Fish and Game Conservation Officer Chris McKee said. 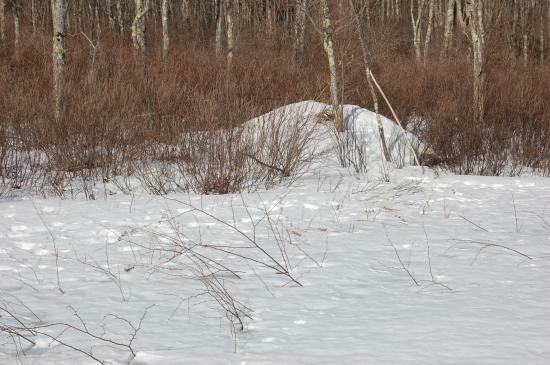 McKee is investigating separate incidents in Kingston and Raymond that left four wild turkeys dead. 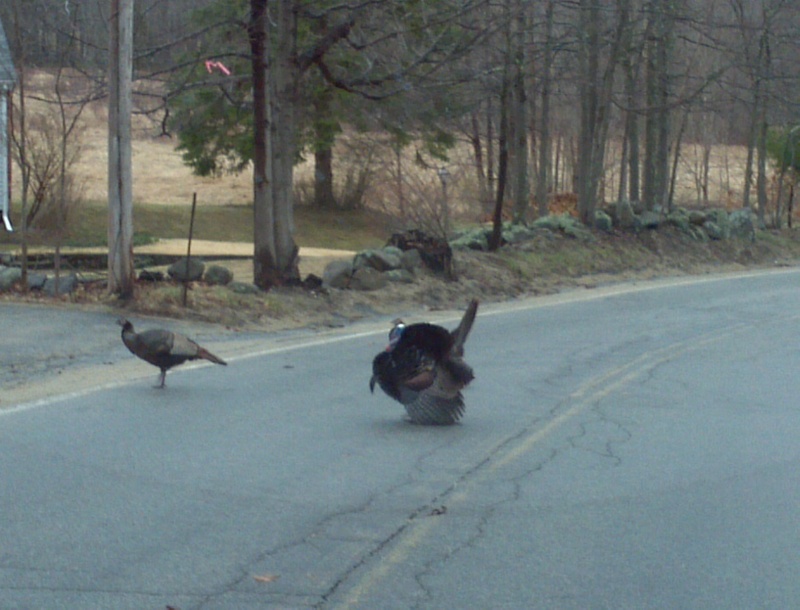 Two people were recently charged in connection with allegedly mowing down three wild turkeys with a vehicle on Hunt Road in Kingston. McKee said the vehicle was driven off the road to strike the turkeys. 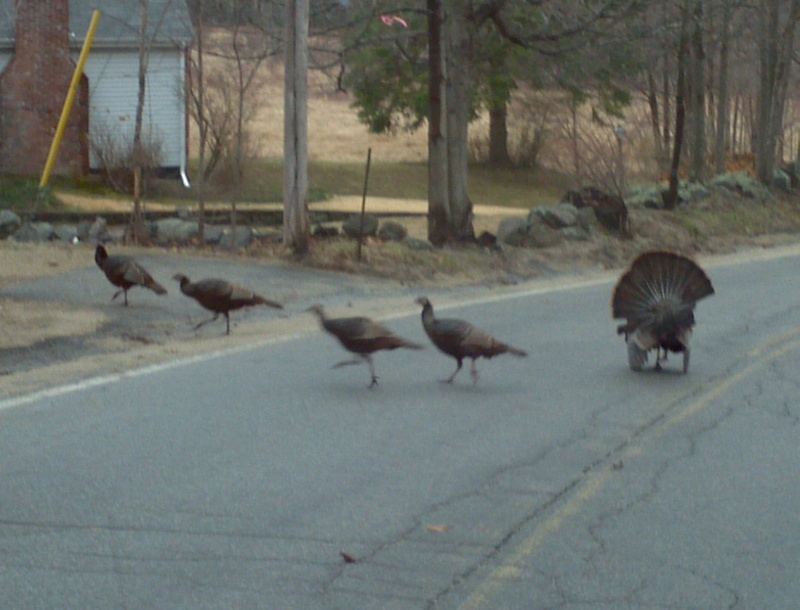 In mid-November, a neighbor told authorities that he saw a man in a sport-utility vehicle drive onto a private field on Harriman Hill Road in Raymond and attempt to run down a turkey flock. “He tried to chase it down, but was unable to catch up to it,” McKee said. 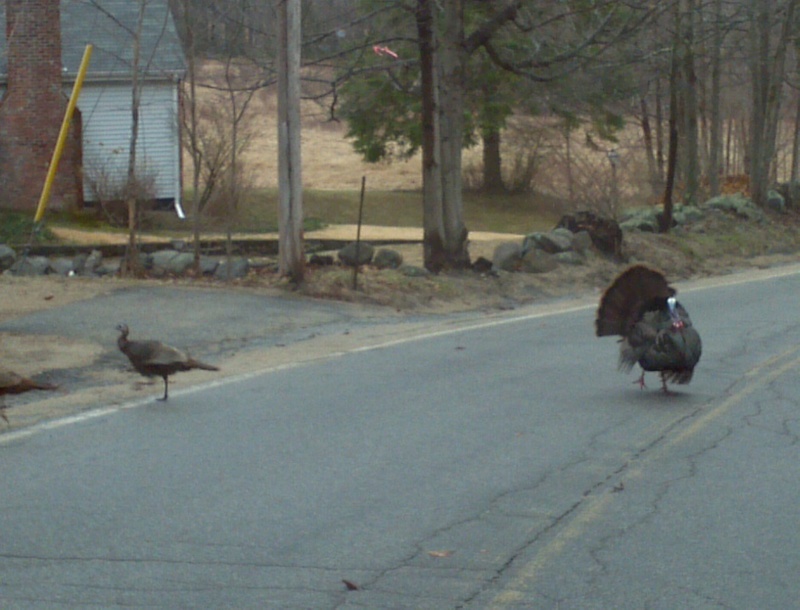 One of the turkeys was struck and killed near an area along Harriman Hill Road where a school bus drops off students. McKee said the man who witnessed the incident picked up the dead turkey so the children wouldn’t be startled when they arrived at the bus stop. The turkey killing has angered Harry and Sally Richard, who own the property where the turkeys were chased. “It’s very frustrating. I love the turkeys. They’re like pets to me,” Sally Richard said of the flock of nearly 50 turkeys that often hangs out around their property. Intentionally killing wildlife with a vehicle can result in a charge of “unlawful method of take,” McKee said. The charge is a violation-level offense punishable by a fine of up to $1,000. A person could also be charged with reckless operation, he said. Last year, Ian Gamble of Francestown was issued two violations for taking a turkey with a motor vehicle and for hunting without a license after he allegedly raced through a flock of turkeys along a road in Greenfield. One of the turkeys was killed in the incident, which was captured on video. McKee said he sees incidents like these about once or twice a year. “Apparently they’re just getting their kicks out there,” he said. Harry Richard doesn’t think it’s funny. He said the tire marks from the turkey chase are still visible in his field. “I’d like to see them caught and punished,” he said. According to Fish and Game Department statistics, there are 40,000 wild turkeys in the state. From 1854 to 1975, wild turkeys were extinct, but a flock of 25 turkeys released in 1975 restored the population. In 2012, hunters took 3,873 wild turkeys. 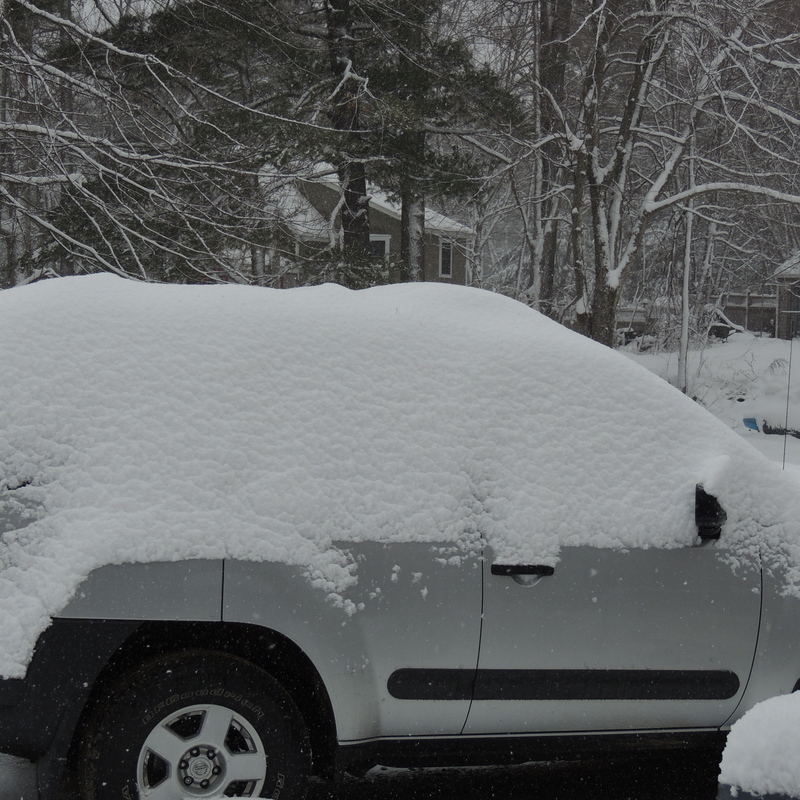 A paintbrush of white dusts the landscape in crystal celebration of the season. I am aware of our mortality and strive to make the most of each day. We can’t take it with us so we must walk our paths with love, hope and understanding. The paths taken on walks in differing season give me pause to take in the lives of some of my natural neighbors. The Beaver population in the wetland system of Pawtuckaway State Park has fascinated me for the years lived in its midst. Enjoy the simple things and you can feel the grand connection to it all. The old stone walls seen all thru New Hampshire and New England were put in place slowly, stone by stone walls were made day by day. They framed old forest and field, stream river and lake shores. The stone walls were made with great effort and persistence. They held the makers hopes and framed their dreams. The walls are not unlike the beavers den and winter food supply, it was all part of survival. We can’t take it with us, but just as the ancestors we can leave our focus. With stones added and landscape shaped by those who cross this path. This den is downlake from where I live. The branches you see sticking up are the tips of a winter food supply that is reached underwater, OUCH! 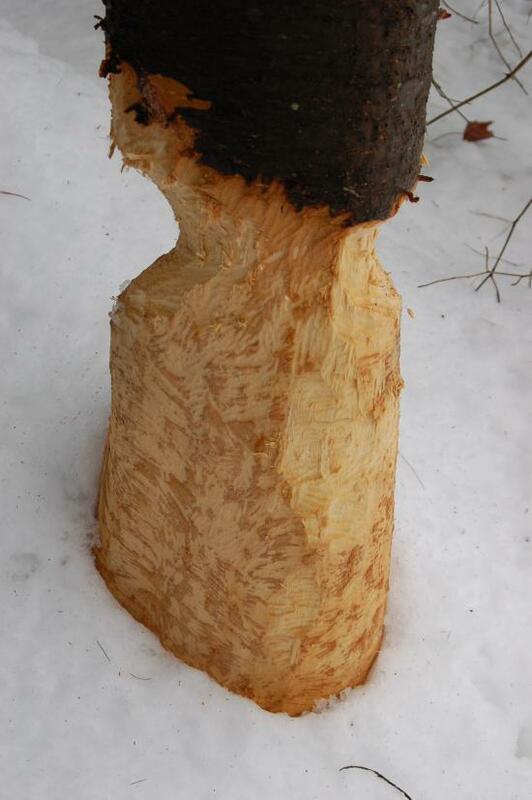 A one foot radius tree that the beaver is working on in an attempt to get at the rest of the tree. If only they could climb it would be easier. Closeup of the tooth marks and work that goes into downing a tree with your teeth. I get tired of chewing downing a large meal! 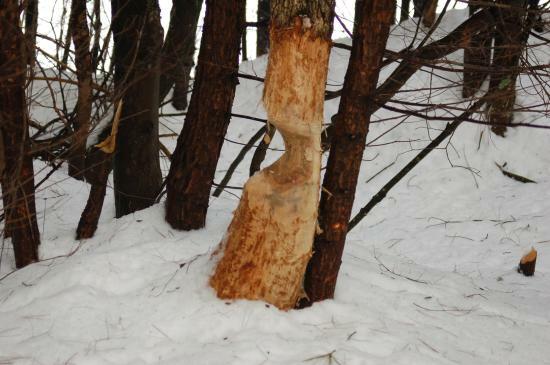 The beaver has cut all of these sections in an attempt to down one tree which is still hung up in another tree. This shows the persistence and determination to survive which is inate in nature. 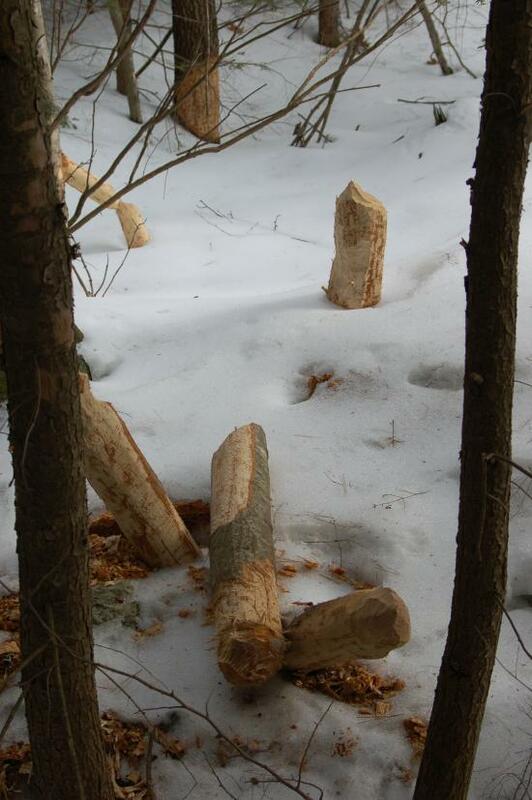 A closeup of the beaver den and the nights snack material. I leave you on this path with the stream that fills the pond. 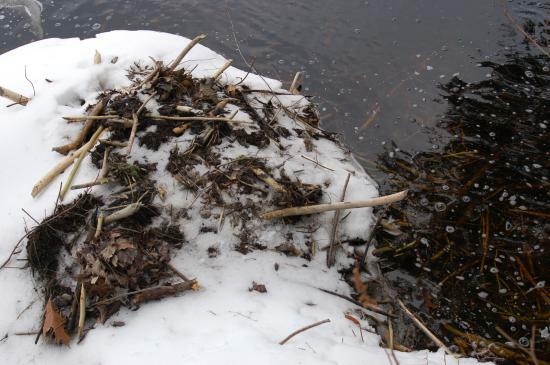 This beaver has built a house with running water! Peace to all!